BE Collective is actively invested in finding and supporting sustainable initiatives. One project we have become involved in is an incredibly exciting electronic waste recycling business, Substation 33. Since its beginning in 2012 ‘SS33’ has recycled in excess of a whopping 500,000 Kilos of electronic waste! Even more impressive – less than 5% of this waste ends up in landfill. 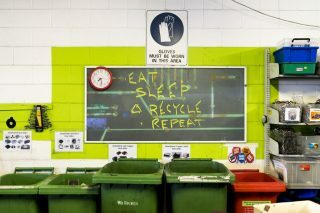 SS33’s work has been described as ‘paradigm busting’ – not only doing incredible work in the electronics recycling field, but addressing community needs too. Substation 33 is generating life learning and skill training experiences for people with mental and physical disabilities and special needs by employing them within the business. Spurred by the genuine care for community that is at the heart of SS33, the enterprise is drawing attention by accomplishing great things in the electronics recycling industry, while at the same time creating jobs for disadvantaged and marginalized individuals and giving them a chance to contribute to something meaningful. BE Collective has provided structural consultancy services pro bono in support of SS33.